Romantic and lightweight, the Shabby Chic Heart Shrug is the perfect wrap for your next wedding, dinner or picnic. With endless possibilities with regards color or fabric, the Shabby Chic Heart Shrug has you covered! The heart motif in the centre of the back is a little whimsical and sets this wrap apart from the ‘norm’. Use cotton to create a daytime wrap, or source some sparkly or silky yarn and turn this into a stunning evening shawl! Create your Heart Shrug in several different colors (blues, pinks, greens, grey) so that your wardrobe is ever changing. You can even use one of the color-changing yarns (eg Caron Cakes) and create a work of art! The sleeves reach the elbows, softly draping down so that your back is beautifully covered. Full written and pictorial instructions included so that you will successfully create the Shabby Chic Heart Shrug for you and your loved ones. 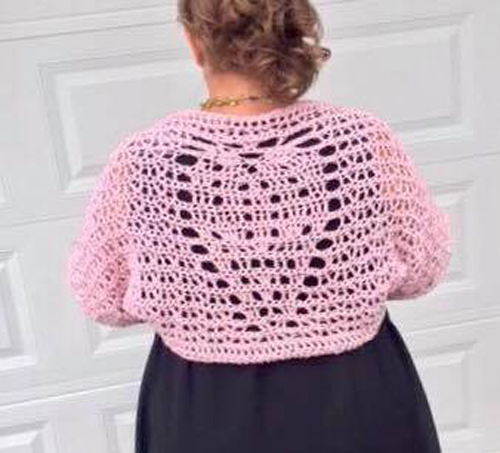 The Shabby Chic Heart Shrug Crochet Pattern has been tested by independent crocheters (some of their amateur photos are in the gallery). Shabby Chic Heart Shrug Crochet Pattern is provided in US or UK/AU versions. Included with your step-by-step instructions and photos is a chart that will help guide your hook to completion. If you’d rather not make it yourself, you can order this shrug, made to order, from MadeforYOUbyFi. Crochet Hook: 8mm (L/11) – or size needed to achieve gauge.